Get access to our entire video library for one low price! Create organic looking digital illustrations and avoid getting lost in the details. Concept artist and illustrator Shaun Keenan teaches how to bring life and authenticity to a digital workflow and how to avoid getting lost in the details. INTERACTIVE CLASS. 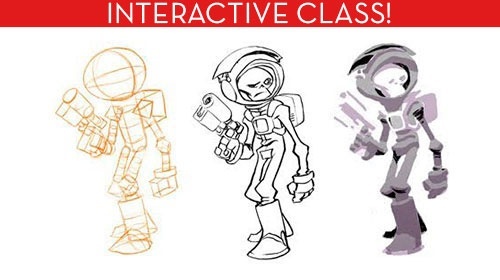 For those character designers that struggle with backgrounds - this class is for you! Award winning illustrator Brian Ajhar demonstrates simple ways to create stunning backgrounds. 9 seats left. Class starts 5/6. INTERACTIVE CLASS. Heads and hands communicate so much about a character in any drawing, which makes them very challenging to draw. Learn to master this skill with David Hohn. 9 seats left. Class starts 5/14. INTERACTIVE CLASS. 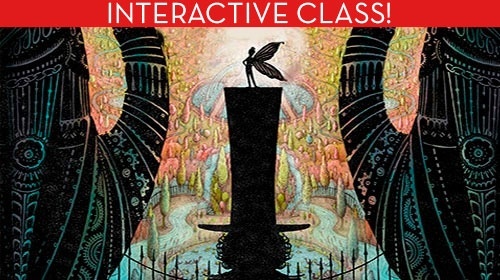 Pro illustrators Lee White and Jaime Zollars will show you how to make engaging book covers that tell a story. 6 seats left. Class starts 5/7. 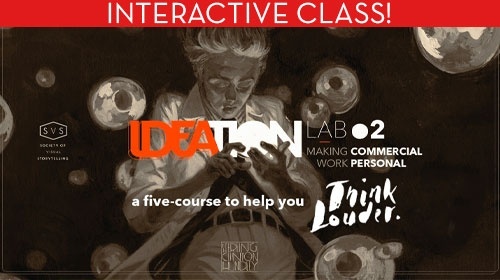 This 5 week course is designed to help aspiring and seasoned professionals refine their approach to creative problem solving, material application and creative processes to give shape to their unique creative vision. 12 seats left. Class starts 5/3. This is the class where we focus on various lighting situations and how to paint them in either traditional or digital mediums. If you understand each situation and follow key steps you'll be able to paint convincing lighting scenarios. Writer and illustrator Mark Pett goes through his career and takes you into his studio to show his process. You'll see what its like to be a professional illustrator and learn valuable insights and concepts from his career experience. If you liked the first class, you will love this one. Prepare to take your inking to the next level with pro inker and creator of Inktober, Jake Parker. Yes, digital pens are convenient and versatile and all, but sometimes you just want to lay down some old school ink on some plain ol' paper. In this video, pro illustrator Jake Parker demonstrates how to take your ink skills to the next level. Prepare to go deep into the world of brush pens! Follow along as ink master Peter Han gets into the mechanics of brush pens and demos how they perform. Part One of three. One of the most important subjects an artist can learn is Figure Drawing. Instead of learning a cookie-cutter formula on how to draw a specific image, we’ll approach it in the tradition of classical figure training. Gesture is the most important part of a figure drawing. Gesture drawings are very simplified lines, so they might resemble stick figures, but they’re not. They show the motion of the pose and they're important for drawing figures. 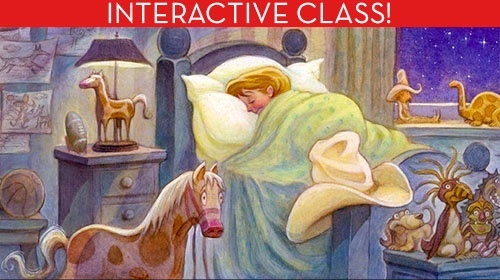 INTERACTIVE CLASS. 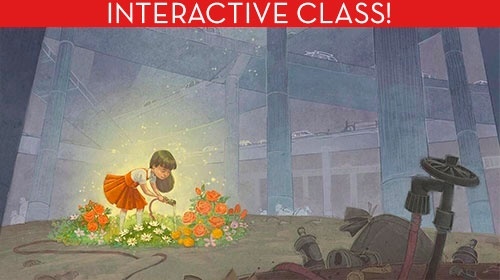 Fundamental class showing you tried and true strategies for building solid concepts for your illustrations. UPCOMING DATES TBA. Learn the fundamental methods for starting a portrait painting from life, and having a successful experience painting! INTERACTIVE CLASS. 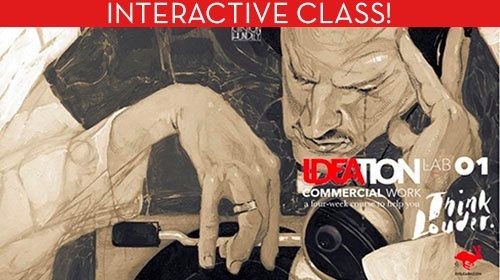 Learn to generate unique ideas that communicate powerful messages in your illustrations, with renowned illustrator Sterling Hundley. Includes LIVE critiques with Sterling. UPCOMING DATES TBA. An intro course on the tools, philosophy, and techniques of becoming a great sketchbook artist. Ever wonder how to get your artwork in retailer stores like Target and Walmart? In this video, Gina Jane will show you how to license the same image on different kinds of products, from gift bags to textiles. 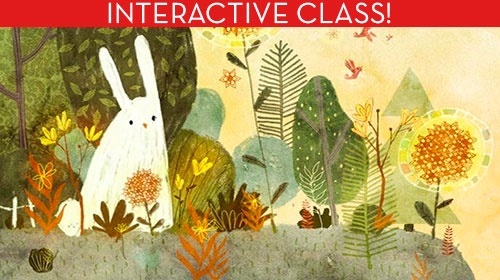 Finally - the class where you're encouraged to paint the details! In this class we explore a wide range of textures and break them down to help improve the level of finish you can achieve. This is the self-directed version of this class. The road from a blank canvas to a final painting doesn't need to be a scary one. Join illustrator Anna Daviscourt as she guides you through transforming a sketch into a luscious digital painting with four simple steps! An in depth look at how to go from initial concept to final image. Follow along as Jake Parker demos his strategy for designing a character! This class was designed to give you the major principles that you would learn in a color theory class. Learning to communicate with color is necessary and fundamental to becoming an effective visual storyteller. In this video, Will Terry chats with Piper as she creates one of her daily paintings for your viewing pleasure. They discuss her art process, getting into the art biz, schooling options for artists and more in this packed 2-hour episode. You could wait around for the Style Fairy to sprinkle a little magic on your work, or you could try these 3 easy steps. INTERACTIVE CLASS. This beginning digital painting course will teach you everything you need to know to be a great painter in Photoshop! UPCOMING DATES TBA. As artists and writers we are selling ourselves as much as our art form. It's important to be aware that the brand we put out in the world can affect our business (for good or for bad). The rebooted version! Featuring more instruction, more exercises and more Skull Chaser! This is a comprehensive course on the elements, principles, techniques, and tools of drawing. INTERACTIVE CLASS. Featuring personal instruction from Jake on YOUR art. 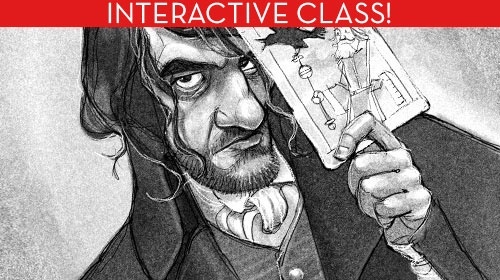 This is a comprehensive, TEN week course on the elements, principles, techniques, and tools of drawing. UPCOMING DATES TBA. How can artists find freelance work? Pro illustrator Will Terry goes over strategies for landing that gig, including how to build your contact list. Learn how to make those colors pop! Pro illustrator Will Terry demos his strategies for picking colors, color schemes and light temperature in your paintings. Here's a little trick for keeping your characters consistent throughout a big storytelling project - try drawing from a maquette! Sculptor Dan Mortensen shows you how to make a maquette for reference. Pro illustrators Jake Parker, Will Terry and Lee White talk about all the things that can keep you from creating that masterpiece. Find out how to battle creative block! How do pro illustrators approach an assignment? Join Jake Parker as he creates this fun monster image for a group art show at a kids museum. Do you need an agent? Team SVS is joined by agent Ryan Sanchez in a lively roundtable discussion on what an agent can do for your art career. Everyone's got to start somewhere! The founders of SVS talk all about their origin stories, and how they managed to turn their art skills into a living. How can artists find that magical balance between work and life? Special guest Sarah Jane talks about her strategies for raising a lovely family while building a successful illustration career.